Huge Savings Item! Save 12% on the 3dRose Uta Naumann Watercolor Illustration Animal - Cute Animal Illustration of a Fox in Winter Snow- For Children - 16x16 inch quilt square (qs_269052_6) by 3dRose at Animal Backgrounds. MPN: qs_269052_6. Hurry! Limited time offer. Offer valid only while supplies last. Cute Animal Illustration of a Fox in Winter Snow- For Children Quilt Square is a great way to create, showcase and remember a meaningful moment. 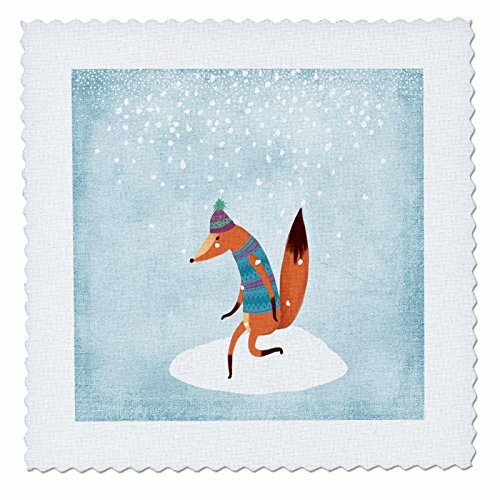 Cute Animal Illustration of a Fox in Winter Snow- For Children Quilt Square is a great way to create, showcase and remember a meaningful moment. Overall size is 10" x 10" with 7.5" x 7.5" image. Made of 100% poloyester that will not fade with washing. Made in USA. Image will not fade with washing. View More In Quilts & Sets.